Help CentreUsing SuperControl Managing guests, emails and auto correspondenceHow do I hyperlink text in an email? 1. Go to Emails/Letters > Edit. 2. Click Edit on your chosen letter and then highlight the text you would like to hyperlink and then click this icon on the toolbar. 3. 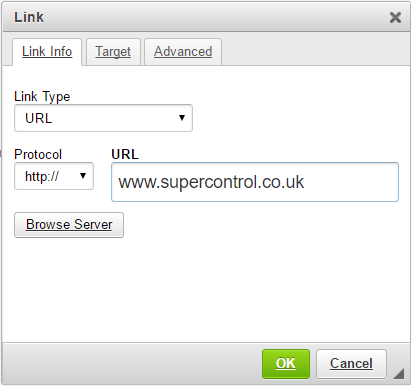 If you’re linking to a website, enter the web address in the URL field. If you’re linking to an email address, select “Link type = Email” and enter the email address below (you can also choose to enter a default email subject and message body). Then, click OK.
Prev: Can I add automatic emails to pre-existing bookings? Next: How do I merge duplicate guest records?